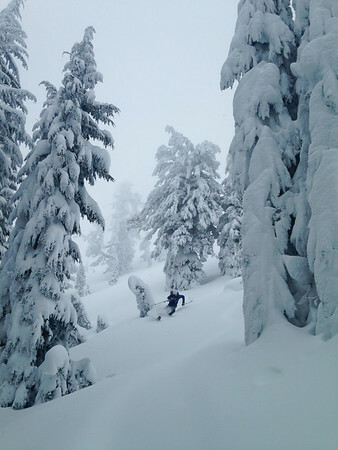 Synopsis: Following periods of heavy snow during Christmas week, the Tahoe Basin was subject to particularly strong winds that impacted much of the alpine zones above tree line, leaving wind scoured surfaces. However, the near tree line and below tree line terrain sheltered the snow from the intense winds. Coupled with very cold temperatures, the tree skiing continues to be excellent. With more storms forecast this week, fingers are crossed for more days out like this. Synopsis: So far in November, the Tahoe Basin has been consistently receiving small winter storms on a weekly basis. What has been interesting is that November in the Tahoe Basin has been below historical average for both total precip and snowfall. However, with the horrible “winters” the past several years, everyone is obviously excited with cold, consistent snowfall coming in. This past week in fact, Tahoe got a very cold storm dropping down from Alaska the Wednesday before Thanksgiving, followed by well below average temperatures the remainder of the week into the weekend. 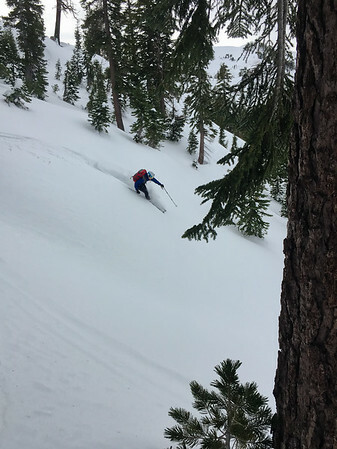 Early season in Tahoe this year was coupled with big expectation and hype (including the December Mega Storm), which as typical largely under delivered on account of fluctuating snow lines. As of present, we are once again combatting a high-pressure ridge off the West Coast leading to another dry January. As I sit and await our historically biggest snow months of February and March, I think back to some great days early season in December. 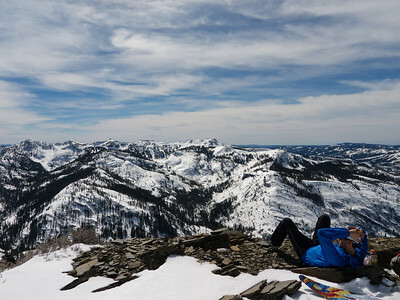 There were certainly good days to be had, both in the resorts and touring in the backcountry. Similar to the rising tides and fluctuations in the weather, each day had its ups and downs. Once such great day in December had a lot, in fact! 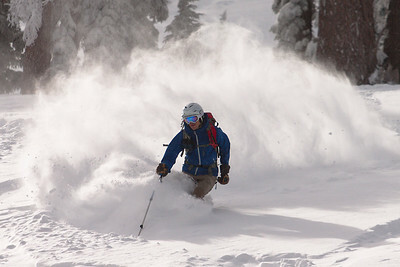 Synopsis: Armed with high-pressure, clear skies, a decent re-freeze the prior night and a light, Southwesterly wind, Colin and I decided to head out last Saturday for the classic Sierra Crest tour from Sugar Bowl to Squaw in the North Lake Tahoe Basin. I don’t think I am surprising anyone in saying that this season has been pretty bleak in Tahoe for snow accumulation, and I think a lot of the pictures below will show how thin the sun-exposed aspects are right now. Still, it felt great to get out on a longer tour and get some exercise. I particularly like these “meadow skipping” type tours where you cover longer distances to see a lot of terrain. I particularly like multi-day tours in the Eastern Sierra in the Spring, but this season (like last season) is looking like May will be more devoted to High Sierra climbing. Warning – there are not a ton of action ski shots in a tour like this, but figured I have not posted a TR in a while so why not. Synopsis: During late last week, another early season storm fell across the Tahoe Basin with extremely cold temps (by Tahoe standards) and light, dry snow. A group of us headed up to Alpine Meadows for a couple of days of backcountry touring. I note “backcountry” as Alpine Meadows is currently closed until the resort opens in December, and therefore the terrain and snowpack is uncontrolled from an avalanche perspective at this point. Ultimately, we had a great time skiing in good conditions without much incident over the course of both days. Alpine Meadows must have had upwards of 100 people backcountry ski touring, boarding and snowshoeing around the mountain on both days. I have heard of similar reports from Kirkwood and Sugarbowl. However, as I write this Trip Report, I do so with some sadness and an introspection about the fragility of life in general. As I found after this past weekend, at some point on Saturday (likely after we had left for the day) a young skier suffered a traumatic accident while telemark skiing at Alpine Meadows. She was telemark skiing for the first time, likely enjoying a beautiful day with her friends in the exact same fashion we were elsewhere on the mountain. I since learned that she suffered a crash while skiing (and wearing a helmet) and struck a rock buried in the snow relatively hard. Ultimately, due to the strong efforts of her companions and the Alpine Meadows Ski Patrol (who were on site conducting training at the base), a valiant effort was made to transport her via helicopter to emergency care. Unfortunately, she suffered critical injuries in the fall and she has since passed on.